Dr. Donald M. Sesso, D.O., board certified in Otolaryngology and Sleep Medicine, is the only fellowship trained sleep surgeon in the tri-state area. 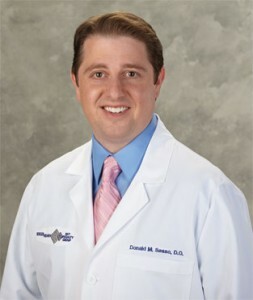 He is widely known as Philadelphia’s snoring doctor. Treating both adults and children, Dr. Sesso is trained in all aspects of otolaryngology and specializes in sleep disorders, the surgical treatment of obstructive sleep apnea (OSA), and advanced endoscopic sinus surgery and allergies. He is a member of the American Academy of Otolaryngology, American Osteopathic Association and American Academy of Sleep Medicine.